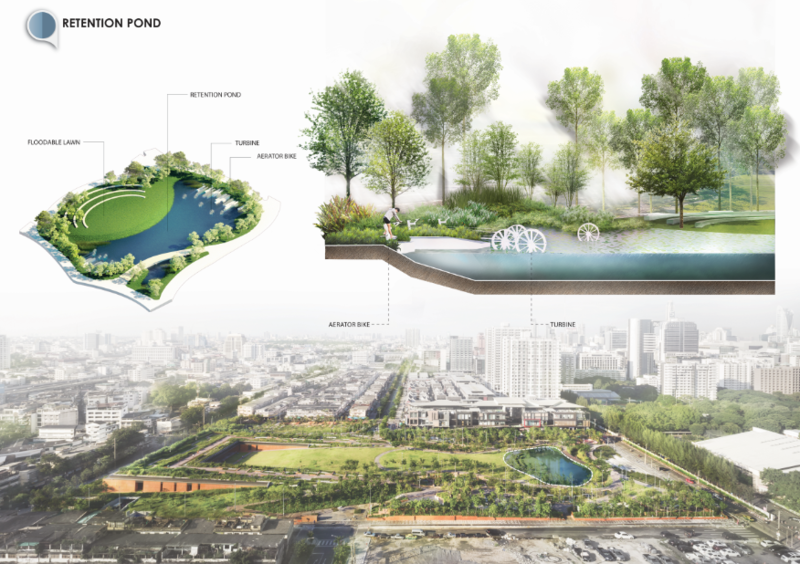 Just as New York has Central Park, Bangkok has just received its lungs of the City – the Chulalongkorn Centenary Park, the first sizeable green infrastructure project, which has been designed for the city to face the inevitable realities of climate change. 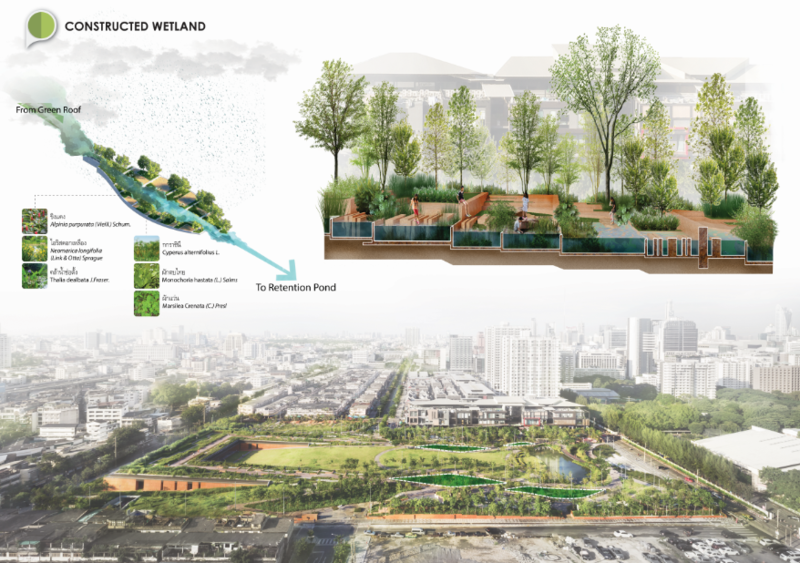 We teamed up with the landscape architects of the project, Landprocess, to tell this story in an intimately visual way. 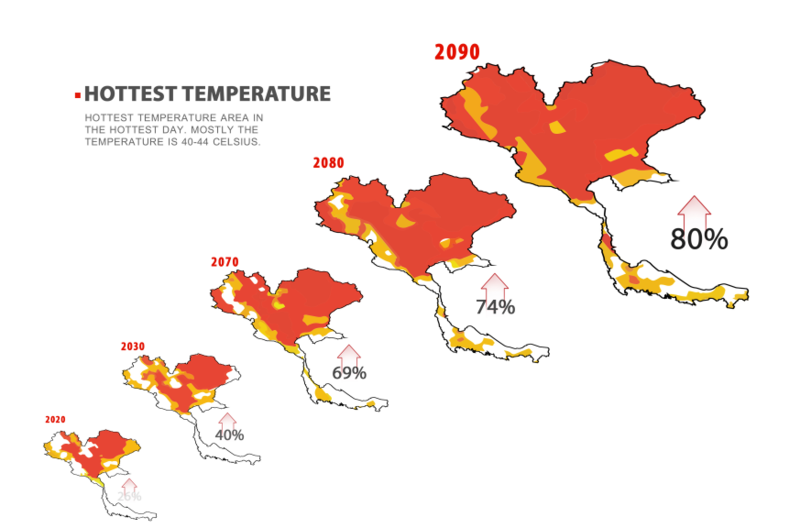 Through a series of infographics, maps, diagrams and visualisations, we will be demonstrating the seemingly looming climatic uncertainties of Bangkok and the solutions that Chulalongkorn Centenary Park provides to mitigate these issues. The inevitable reality feels like a distant fate until we explore the figures. Bangkok is not how it used to be and Figure 1 shows the creeping grey fingers of urban development that is eating away the agricultural land. This is a grey city with a lack of outdoor public space. Once upon a time, in the 1900s, the agriculture land absorbed the seasonal flooding and cycles of the monsoon rain. Today, the heavy construction process and designs have not explored ways to deal with climate change. 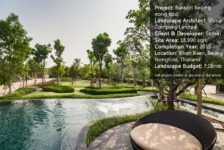 Bangkok is a popular city that is rapidly developing and relies on hard landscape designs. Unfortunately, we are telling the same sad story that most of the major cities in Asia are facing today. 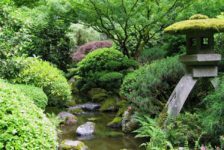 This reliance on hard landscape designs have created a city with urban heat island effect and one that is very thirsty for more green spaces and water management solutions. 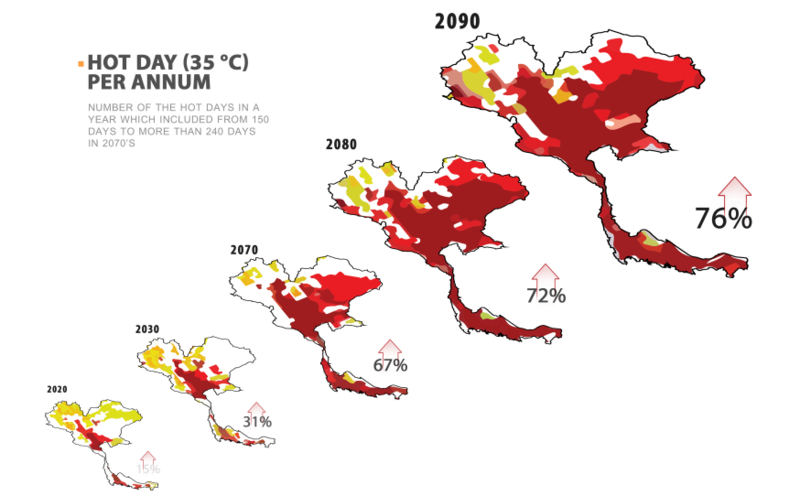 This poses a threat and Bangkok has experienced increased flooding and rising temperatures. 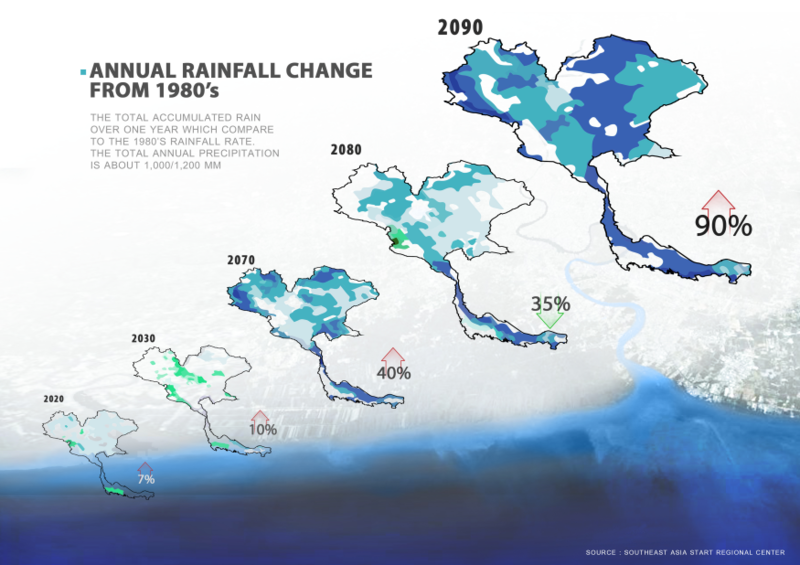 For example, the percentage increase of the total accumulated rain over a year, since the 1980s, is expected to increase by 7% in 2020, and by 2090, this will further increase by 90% (see figure 2). That is within the lifetime of the young children of today! Moreover, being at sea level, there is an increasing list of threats from rising seas, storm surge, heavy seasonal and monsoon rain. And as figure 3 shows, there is no permeability for the excess water with an increasing amount of hard landscape. 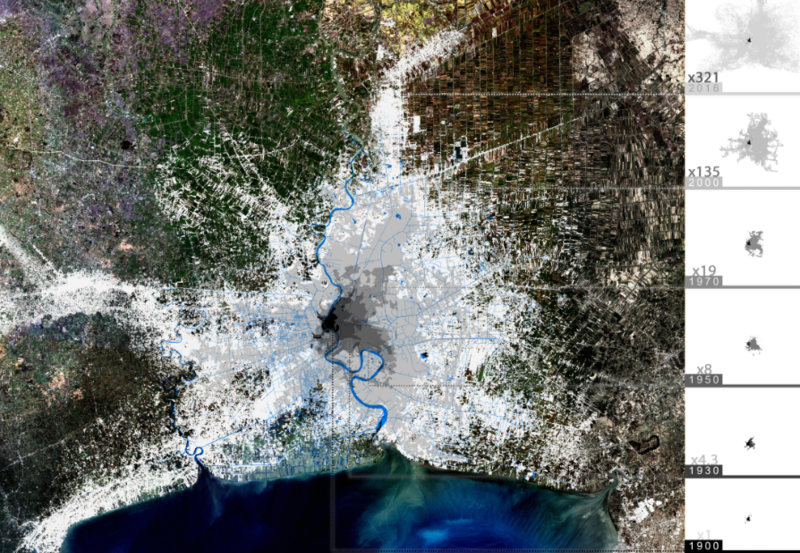 The reality is that Bangkok is slowly and silently sinking. The need for resilient and protective design for today and the future is an essential solution for the city. Chulalongkorn Cenetary Park is located in a major university campus in central Bangkok. As the name suggests, it was 100 years ago that the University was founded and for this celebration, the university has given this commercial area, which connects the campus to the city, to serve as a public park. Bangkok’s reclaim to its historic waterscape urbanism is becoming more of a reality. 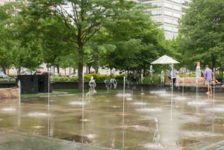 The park then becomes an important and shared piece of green infrastructure with pedestrian and bicycle transport links and areas that perform ecological functions. The university’s symbol is the rain tree, which gives a basis for a strong conceptual and literal notion of the tree roots absorbing the water, meandering and reaching out into the city to create a green oasis once more. Landscape architect Kotchakorn Voraakhom is the founder of Landprocess, a design firm dedicated to tackle resilient issues and protect the vulnerable communities from troubling climate change events. 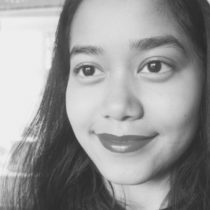 Her and her team are advocates for bridging the environmental and social needs, and Kotchakorn also founded Porous City Network, a landscape architecture social enterprise working to increase urban resilience in Southeast Asian cities. 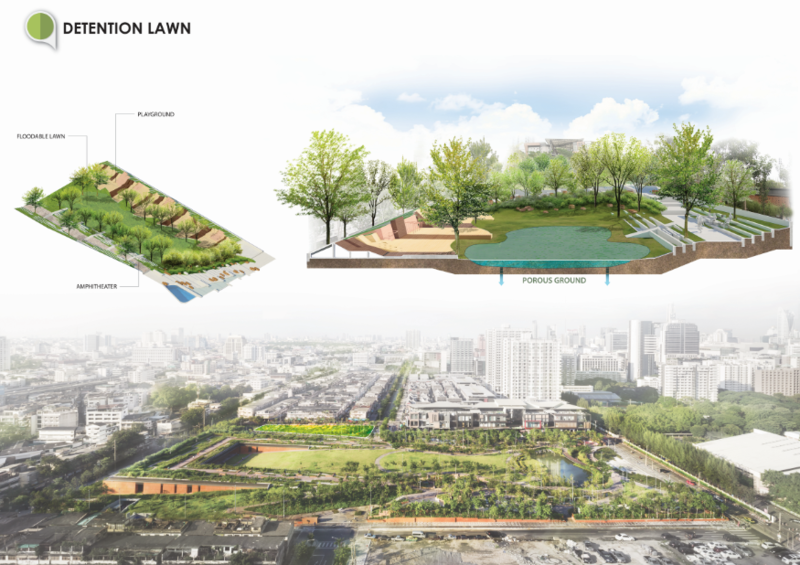 Along with the Chulalongkorn Centenary Park, Landprocess has also created productive public green spaces along the floodplain and coastal areas of the city. 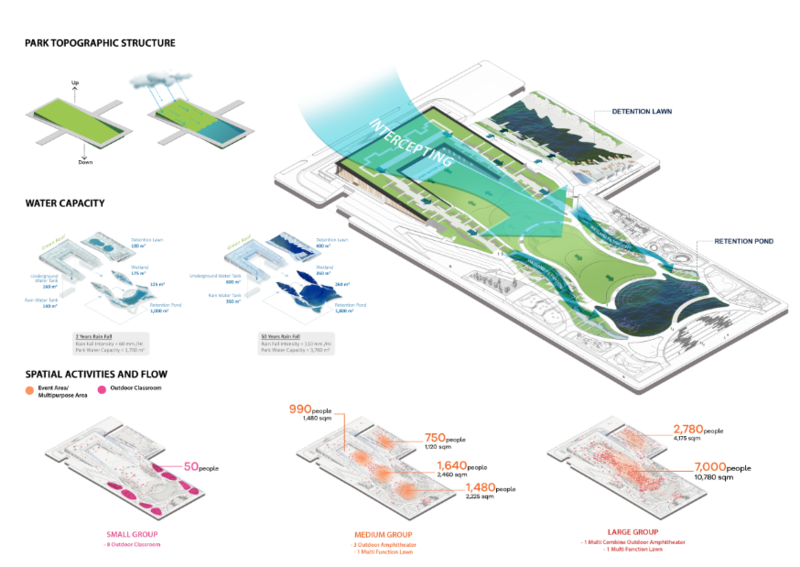 The park is a system that absorbs and control water and provides a green, shady, climatic relief for everyone. The size of the park is about 5ha with a 1.3km green avenue. In order to provide proper water treatment function, there are components that make up the park’s water treatment system. 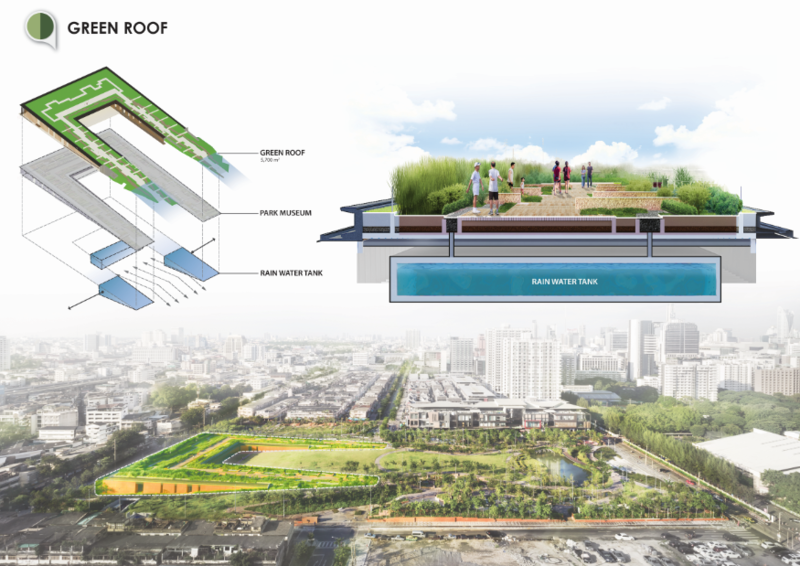 It starts at the highest point, the green roof. Planted with native grasses and low maintenance weeds, they help to absorb water, which is stored in the rain tanks below. The overflow drains to the constructed wetlands, which are along the park’s sloped inclined plane. Features of the wetland are weirs and ponds where the water is cleaned thoroughly before reading to the lowest point of the park: the retention pond. The retention pond completes the water circulation with the idea that during the dry season, water will be pumped up from the pond to replenish the ponds of the wetlands or irrigation of the plants. The water treatment system also collects water from surrounding neighbourhoods for cleansing and usage for both the park and the neighbourhoods. Interactive water treatment bikes, when ridden, will create movement and introduce more oxygen into the water. This of course will educate and inspire the public. 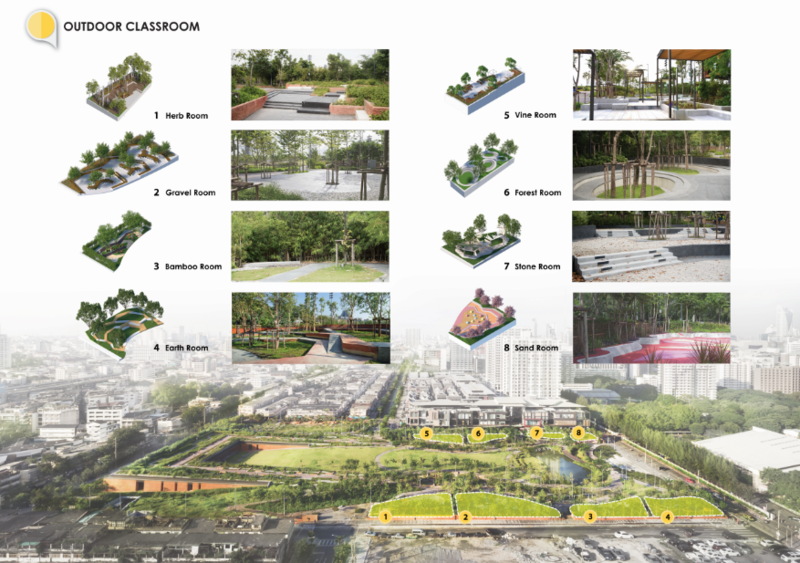 In addition, there are eight landscape rooms, which embody different spatial arrangements and qualities of outdoor classrooms, including programs such as a herb garden, an amphitheatre, meditation walk and reading area. The project highlights some of the most critical situations we will face in cities. 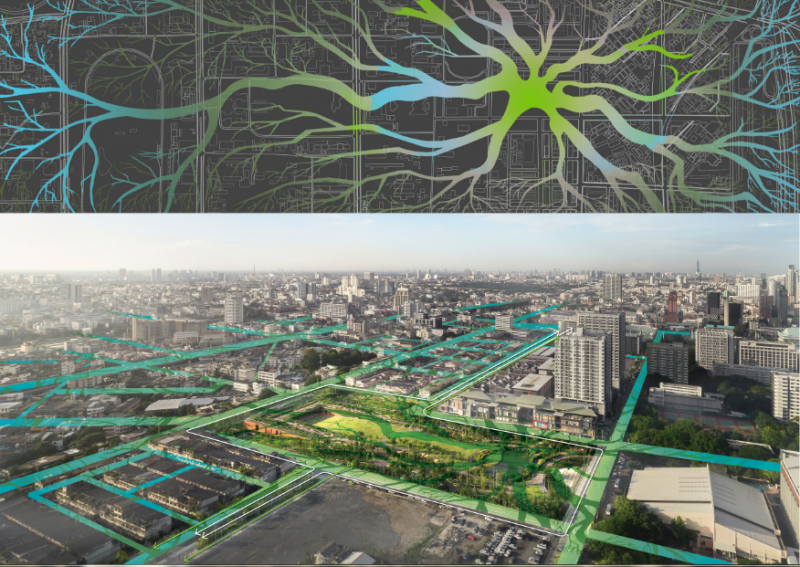 Not every city will be able to afford a large space for a park like Chulalongkorn Cenetary Park but there are many other creative solutions, such as sustainable drainage system (SuDS) solutions like swales, retention ponds, pocket parks, urban farming, urban forests, canal restorations and many more. Sustainability has been a widespread topic over the last ten years and we are heading to the days of resiliency and creating more resilient designs to enable our cities to cope with these changes. Urban sprawl is inevitable and it is predicted that the number of people living in cities will continue to rise. How we handle this is up to us. If you want to find out more information on how cities can transition from grey to green infrastructure network, head over to Porouscity.org. 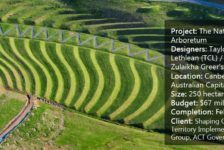 Win is a Landscape Architect currently undergoing Chartership process in Bath, England and has been a volunteer writer for over 5 years. 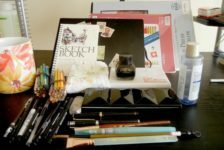 Her writing, which she intends to contribute for Land8, is a valuable way for her to connect people to places, increase social inspiration and gain more knowledge about the complex world we live in. I’m definitely NOT an expert on Far Eastern Nation’s environmental issues……but, IMO, any efforts to “green” up large Asian cities could very well be a “waste of…..time and money”. Because, the most critical environmental issue (in my mind) in those large Asian Cities…..Beijing, Hong Kong, Seoul (South Korea), Tokyo & yes, even Bangkok…and several other cities in this part of the World….is “Air Pollution” due to excessive CO2 emissions! This issue should be their #1 priority. But, with their city populations continuing to grow by the thousands every year, the CO2 problem can only get worse. 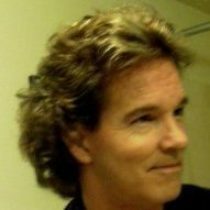 In Seoul, South Korea (for example)…the Government shut down (650) downtown parking garages/lots…due to the high CO2/Air Pollution problems…forcing thousands of workers to use “mass transit” to get to and from work. 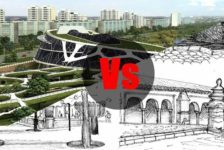 So, adding City Parks & other green spaces in Bangkok and other Southeast Cities seems like a GREAT idea, but, it’s my “understanding”….maybe I’m wrong…that they are more interested in “financial interests” by building more and more skyscrapers & industry, than improving the quality of their lives.